Associate Professor in the Department of Family and Community Medicine at the University of Toronto in Ontario and Scientific Editor of Canadian Family Physician. Sometime after I left home at the age of 21 to go to graduate school at the University of Toronto in Ontario, my father gave me a small brass box. It contained a few items—a newspaper clipping from the Prestwich Guide with an article about my granddad Jack Pimlott on his retirement, a copy of his World War I discharge papers, a photograph of my father skiing in the mountains of Cyprus during his military service, and my father’s service medal—none of which at the time meant that much to me. Growing up, my father never talked about his military service in the late 1950s as a peacekeeper with the British army in Suez and Cyprus. As for my grandfather, who died before I was old enough to really get to know him, I knew 3 things: that he had been a war hero, receiving the Military Medal; that it had come at the price of his leg, which had been blown off at Passchendaele, and a body full of mustard gas burns; and that he served in the Royal Horse Artillery. These were things my father told me. My only real surviving memory of him was the dark yellow nicotine stains on the index and middle fingers of his right hand. That brass box sat buried for years at the bottom of a drawer. The box and its contents only came to life and to have meaning for me when my eldest son, Alistair, began to ask about the history of our family. Like many boys, around the age of 11 or 12 he became quite interested in war, politically incorrect though that was. It was when he asked to take the box to school for “show and tell” on Remembrance Day when he was in grade 7 that we opened it and carefully examined the box, its contents, and its provenance. “Is that the box that Great-Granddad’s medal came in?” he asked. I had always thought so, but when I finally asked my own father, I learned that it was not. These days one can easily go online and find out about anything, so Alistair and I did. 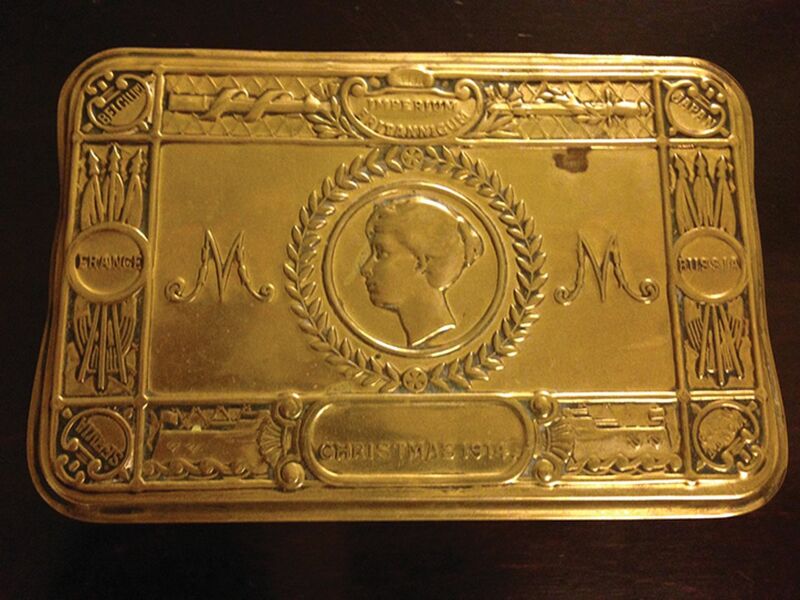 In 1914 British troops at the front received a Christmas gift from the Princess Royal, Mary, an engraved brass box just like the one I inherited. It originally contained a packet of cigarettes in a distinctive yellow package, a small amount of tobacco, a pipe, a tinder lighter, a Christmas card, and a picture of the Princess herself. The box is about 5 inches long by 3¼ inches wide by 1¼ inches deep, with a hinged lid. On the lid is a depiction of the head of Princess Mary in the centre, surrounded by a laurel wreath and flanked on each side by the M monogram. My father had mistakenly thought as a boy that these stood for Military Medal. On the top, a cartouche contains the words Imperium Britannicum with a sword and scabbard on either side. On the lower edge, another cartouche contains the words Christmas 1914, which is flanked by the bows of battleships forging through a heavy sea. In the corners, small roundels contain the names of the Allies—Belgium, Japan, Montenegro, and Serbia. France and Russia are at the sides, each superimposed on 3 furled flags. “Where is Great-Granddad’s medal?” was an inevitable question. It was long gone. Family legend had it that he was so embittered by the war and its consequences for him that he threw it away in Heaton Park, but it is more likely it was simply lost. Before he went to France to fight in some of the war’s bloodiest battles, my granddad Jack had worked for Lancashire and Yorkshire Railway in Newton Heath in Manchester, England (Newton Heath railway workers were the founders of the football team that eventually became the famous Manchester United). Young men going off to fight were led to believe that when, or more likely if, they returned home they would have their old jobs back. When Granddad returned missing a leg, he was told there was no job for him. Only those who were conscripted had that right, not those young men like him who were so eager to fight for their country that they voluntarily enlisted. His discharge paper, No. 5956, 3 pieces stained by the cellophane tape that once held them together, hints at much. John Pimlott, gunner in the Royal Horse Artillery, enlisted at age 22 on September 2, 1914, at Bury, Lancashire, England, soon after the war began. 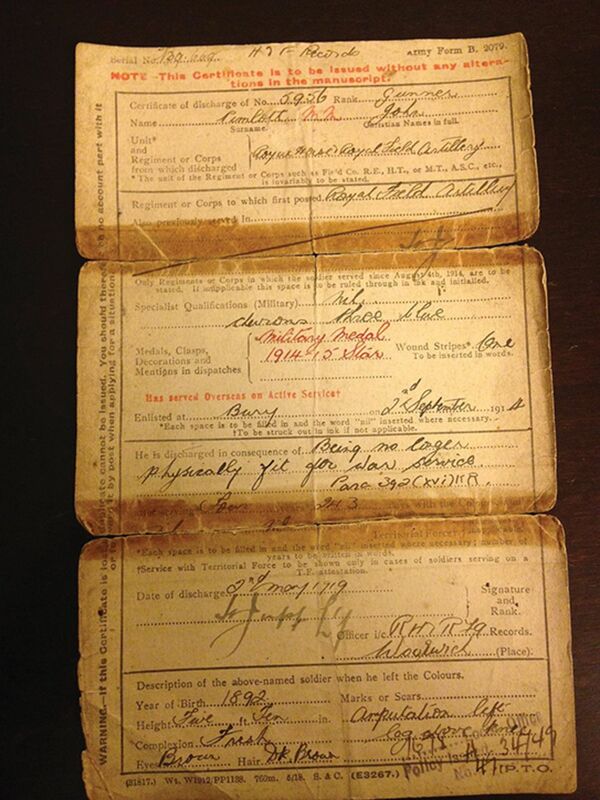 He was discharged on May 2, 1919, 4 years and 243 days later, “being no longer physically fit for war service.” The document is deceptive, as he spent months in the hospital in Liverpool, England, before he was finally discharged. The initial amputation of his left leg was eventually extended above the knee. Eventually my granddad got a clerical job with the Bury town council, a job he held for the rest of his life. The newspaper clipping is more than 60 years old now, and falling apart. 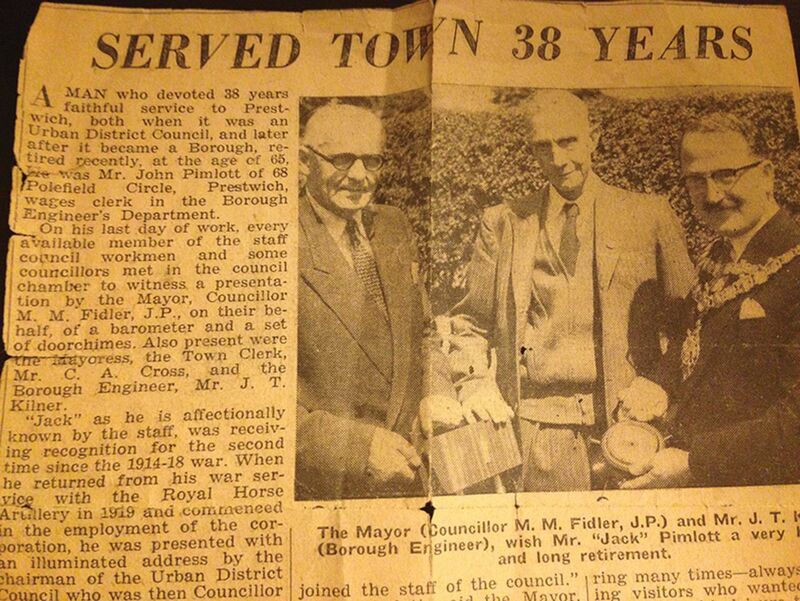 In the photograph that accompanies the article, my granddad is flanked by the mayor and the borough engineer. He is tall but slightly stooped, slender, and dressed in a suit, tie, and waistcoat. His eyes look sunken, his face gaunt, and his thinning hair gray. The article proudly proclaims that it is the second time that “Jack” Pimlott is being honoured in his lifetime. My dad says that Granddad walked to work every day, there and back, and he has memories of his father trudging off to work down Bury Old Road on that artificial leg in all kinds of weather. In his 38 years as a payroll clerk he was never late, nor did he miss a day of work. Now, as a grandson-doctor, I wonder how much he suffered—did he have phantom pain or did it just plain ache walking on that stiff, lifeless leg? And what of the psychological suffering? My father has no idea, as Granddad did not complain. My father remembers that Granddad Jack was always a heavy smoker—up to 60 unfiltered Gold Plate cigarettes a day. During World War II, when cigarettes, along with everything else, were rationed, my father worked as a paper boy and recalls one of his chief jobs was to hunt down the scarce Gold Plates for his dad. My father mischievously told me that if he and Granddad had fallen out, he would moderate his efforts at cigarette procurement accordingly. For many soldiers in World War I, cigarettes became a companion, a solace, an item of trade while at war. Although it was common knowledge that smoking could be bad for your health (cigarettes were known among ordinary people as “coffin nails”), British writer G.K. Chesterton compared the risks of smoking in combat to “the perils of gluttony in a famine.”1 Like many soldiers in World War I, my granddad brought cigarette smoking back with him. By the late 1940s, 8 out of 10 British men and 4 out of 10 British women were cigarette smokers.1 Cigarettes, once a luxury item, were now a necessity of everyday life. To mitigate the effects of his heavy smoking, my father remembers that Granddad Jack would sit by the fireplace so that the second-hand smoke would go up the chimney. My grandmother would regularly scrub the ceilings and walls to remove all traces of his habit. My father says that smoking “eased his nerves” and helped him cope with the things he had experienced during the war. By the time a link between smoking and lung cancer was formally demonstrated by Richard Doll and Austin Bradford Hill in the mid-1950s, my grandfather had been smoking for more than 60 pack-years. I wonder now if the simplistic stages of change model of smoking behaviour and motivational interviewing techniques would have had any effect on my granddad Jack’s habit. I doubt it. The addiction to smoking is a powerful one, as I have seen many times in my own practice. One of the most heavily addicted smokers that I have looked after managed to quit crack cocaine around the time I became his family physician. More than 20 years of repeated discussions about his smoking and its eventual effects on his health and repeated attempts to use nicotine replacement therapy and eventually medications like varenicline failed to help him quit smoking. It was only after a serious chest infection and a lung cancer scare about a year ago that he was able to quit. The thought of dying and being separated from his daughter was finally enough to motivate him. My granddad Jack died in his 70s from a “heart condition,” but my father reckons that in the end it was his smoking, the very thing that eased his nerves and helped him get through life, that killed him. My father, too, is a smoker and has only been able to quit once, briefly, in more than 50 years. He, too, saw and experienced unspeakable things during his mandatory national service. The stories of my grandfather and my father, revealed in the search for the origins of that brass box, have deepened my empathy for those addicted to cigarettes.
. The cigarette century: the rise, fall and deadly persistence of the product that defined America. New York, NY: Basic Books; 2007.
. “Everywhere the soldier will be”: wartime tobacco promotion in the US military. Am J Public Health 2009;99(9):1595-602. Epub 2009 Jul 16.